New Delhi: Could the Kerala floods have been prevented? As the water recedes in Kerala this question will, and should, surface. Having killed at least 370 people, displaced 780,000 and caused ₹ 50,000 crore worth of damage, this is the worst flood Kerala has witnessed in nearly a century. Back in 1924, a combination of heavy rain and a breached dam triggered deadly floods that claimed 1,000 lives. In 2018, history may have repeated itself. Under relentless downpours, poor dam management may have aggravated the floods, raising questions about the role of dams in Kerala and other states. In India’s quest to control water, dams have always loomed large. India is home to more than 5,000 large dams (over 15 metre high), the third largest number in the world, behind the US and China. 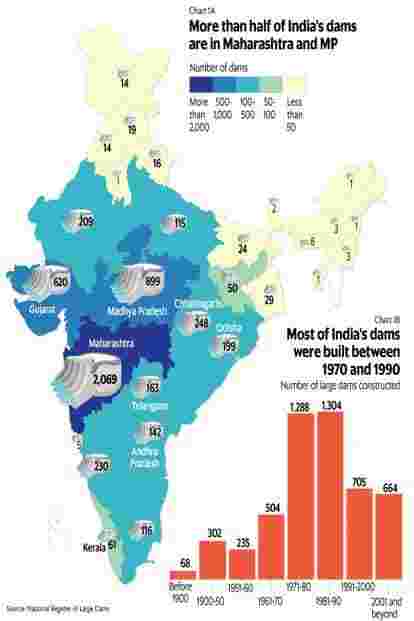 While only a handful of these dams (28) are built explicitly for flood control, in theory, they all have the properties to minimize flood damage. Dams can manage rivers, storing their water, adjusting flows and redirecting channels. Kerala is home to 53 large dams with a collective capacity of nearly 7 trillion litres. As rain poured and rivers overflowed, these dams should have served as a bulwark. 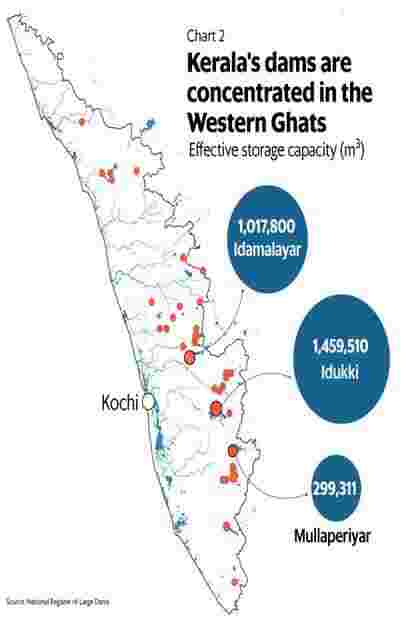 James Wilson, an officer with the Kerala state water agency, estimated that the Idukki and Idamalayar dams (the two biggest) together have stored 21.3% of the Periyar’s (Kerala’s longest river) annual flow, greatly limiting the flood’s damage. But for dams to truly tame floods, experts say dam reservoirs need to be relatively empty before the onset of rains. According to Himanshu Thakkar, coordinator of the South Asia Network for Dams, Rivers and People, this was not the case in Kerala. 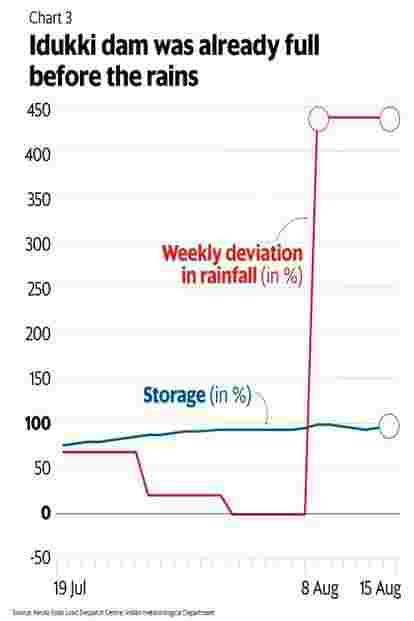 The Idukki dam was already near full capacity by July-end even as rains were relatively weak (below normal levels) during that period. When the downpours arrived in August, the near full-capacity Idukki was forced to release water into already flooded areas. Thakkar believes this lack of foresight is common in India’s dam management and has worsened floods across the country. “Filling up the reservoirs before the end of the monsoon is an invitation to disaster," he said over phone, adding that “while dams can help control floods, they need to be managed properly". More than half of Kerala’s dams (57%) are hydroelectric projects operated by the Kerala State Electricity Board; the rest are operated by the irrigation department. For both entities, the amount of water to store is motivated by demand for electricity and irrigation, rather than flood control measures. These floods also raise another recurring, unresolved issue in Indian dam operations: inter-state dam management. Like many dams in India, the Mullaperiyar is located in one state (Kerala), but operated by another (Tamil Nadu). Both state governments have been in constant conflict over the dam’s water level—in the current crisis, the Supreme Court had to intervene. Beyond dam mismanagement, some environmentalists are pointing to other man-made issues, such as urban development and quarrying. 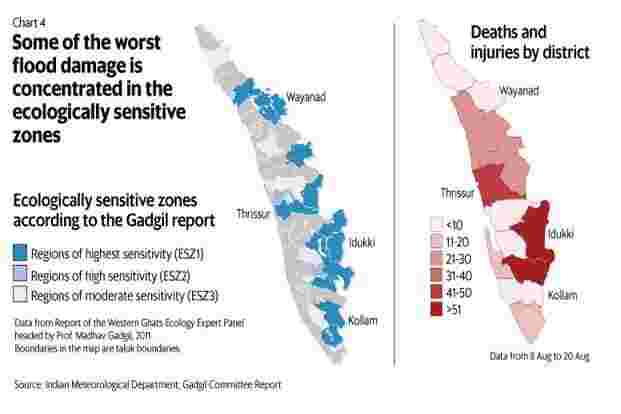 In Kerala, much of which sits on the Western Ghats, development activity can increase the chances of landslides—the biggest source of fatalities in floods. The 2011 Western Ghats ecology expert panel (the Madhav Gadgil Committee report) had labelled areas of the state as extremely ecologically-sensitive where no developmental activities should take place. According to Gadgil, unchecked quarrying and construction in these areas caused these floods. Data from the state’s disaster management control room show that flood casualties and injuries are widespread, but there is some concentration in the few ecologically sensitive areas. Idukki and Thrissur were marked as sensitive and account for 30% of total casualties and injuries. However, other sensitive areas (Kollam and Wayanad) were less affected although they also received very heavy rains. The Gadgil report was sceptical about dams, warning against their construction in the Western Ghats. But most of Gadgil’s recommendations were rejected as too impractical, highlighting the tension between dams and development. Proponents see dams as critical for Indian farmers’ sustenance and renewable energy generation. While the costs and benefits of new dams may be unclear, for existing dams, what is clear is that their management can, and must improve, to limit damages during extreme weather events. Kerala is merely the latest victim of poor dam management: several of India’s floods, such as Bihar in 2016 and Surat in 2006, were exacerbated by poor dam management. In the 2015 Chennai floods, which claimed 295 lives, violation of dam safety norms were a critical factor, a CAG report found. Nidheesh M.K. contributed to this story.